Since 3D city models became feasible as a tool for urban planning some 15 years ago there has been a push towards photo realism in visualizations. With BIM and more intelligent modelling specifications the 3D city model has established itself as much more than just a canvas for an architect’s vision. Various attributes is now a part of the model and it poses a great investment. It is only natural to strive for a higher return by diversifying into new applications. One new application is to use the data in combination with easy to use off the shelf computer games as a mean of communicating the users’ (ie. the citizens’) input back to the decision makers. Today we at GeoBoxers use 3D models, GIS and other spatial data for citizen involvement and co-creation allowing young and old alike to give their input using the most commonly available 3D viewing and editing software – namely the computer game Minecraft. 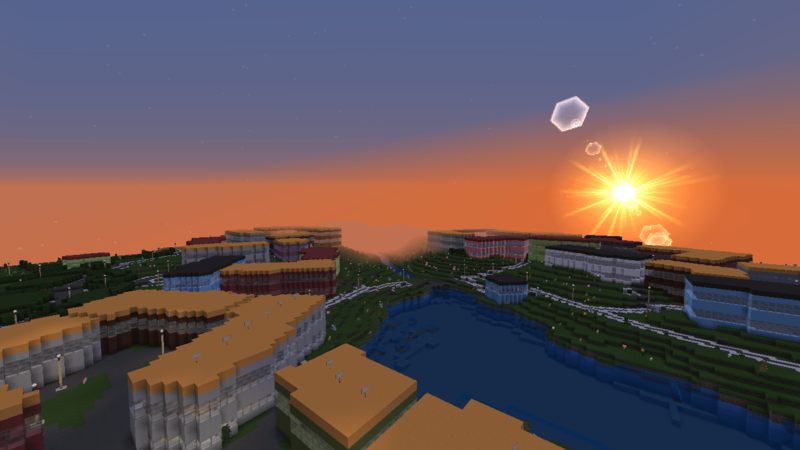 Image from VibCraft – City of Viborg’s open Minecraft server. 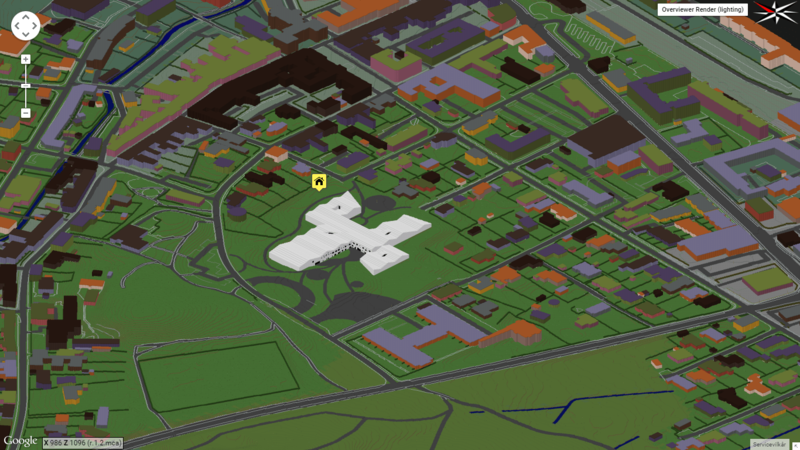 Data initially compiled by Geoboxers using Viborg’s 3D city model and publicly available geodata. Minecraft is developed by the Swedish company Mojang, now owned by Microsoft. In Minecraft everything is made out of cubes and the player is able to interact with everything. While there are many, many other graphically more attractive games around, the simplicity and flexibility of Minecraft has proven its point. Like the computer game’s real life equivalent LEGO, it does not seem to just go out of fashion. The idea to utilize Minecraft for purposes besides “just” gaming emerged some years ago. A huge and very creative community has evolved around the game, which started out on the “indie” game scene. The game was from the beginning designed to be very open and customisable, letting users create and share content like worlds, textures and player skins. 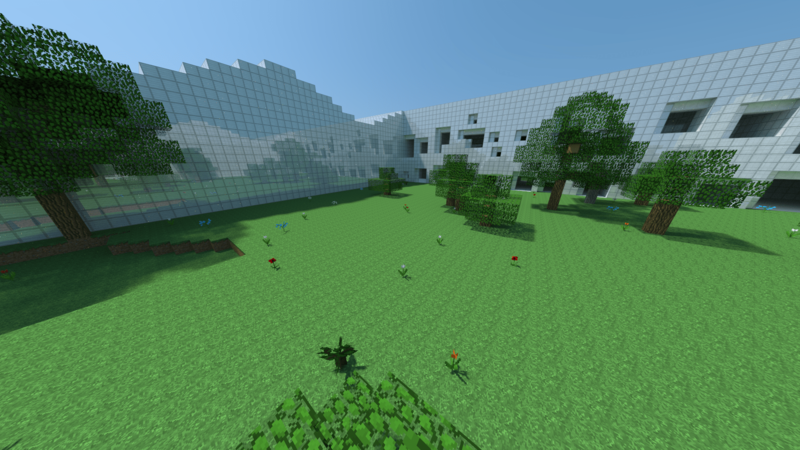 Early on, innovative people realized the potential of using Minecraft in education, utilizing the game as a versatile platform for student creativity and collaboration. Later the idea to use Minecraft to present real world geographical data emerged almost simultaneously several places around the world. Both use cases benefitting from the huge popularity of Minecraft among youngsters, and hence exploiting the fact that most youngsters are familiar with the user interface. The idea of using Minecraft to present geographical data has resulted in projects like Britain in Minecraft by the Ordnance Survey and Denmark in Minecraft by the Danish Geodata Agency. Representing real geodata in Minecraft turns the computer game into a very intuitive 3D geographical information system, that lets you walk around in the data. And given that the user base is much larger than – and quite different from – the user base of any traditional GIS system, the perspectives are quite interesting! Inviting citizens to participate in urban planning is common practice in many cities around the globe. Often the process involves preliminary plans presented to the public on paper or slides, and citizens are invited to bring their input to meetings or workshops. Community collaboration in urban design strengthens ownership and improve results, but children and young people are often not included as participants. Using Minecraft as a platform for urban design enables the involvement of young citizens. A blocky Minecraft world might not be the obvious choice for an architect to present a new fancy building in a photo realistic environment. There are other more suited tools around for that purpose. The strength of Minecraft as a tool for urban planners, architects and the like lies in enabling individuals and communities to interact with and co-create a model in a very intuitive way that is far beyond the scope of other, more traditional tools. In this context a model can be anything from a representation of a single building, a neighborhood with buildings and roads, a park or playground, to an entire city or even a whole country! Most of the elements of the physical environment can be modelled by the blocks of Minecraft, and it is even possible to create some customized block textures suitable for the project at hand. While the game cannot represent minor, tiny details, the blocky Minecraft look is well suited to capture the “broader” picture. Minecraft empowers a generation of young people with the ability to explore designs for houses, cities and landscapes by themselves or in collaboration with others. By using Minecraft as a facilitator to communicate desired changes in an urban environment decision makers, architects and planners can access demographic groups that would otherwise be hard to reach. All kinds of geographically related data can be represented in Minecraft. In Denmark, most geospatial datasets are made publicly available. This makes it possible to use a homogenous nation-covering model of Denmark in Minecraft as a basis for specific local or regional models. Depending on additional available data, a model design is chosen to best suit the given purpose. GeoBoxers were given the task of producing a Minecraft model of the winning architectural design of a new school in the city of Odder, Denmark. The school wanted to involve students in a workshop, where they could interact with the building and specifically develop ideas for the interior design. GeoBoxers produced a Minecraft model of the school from the architects 3D model of the building. The school was placed in its “real” surroundings, which were built using open geodata from the Danish Geodata Agency. The school Skovbakkeskolen. The architect’s 3D model was imported and embedded with publicly available geodata. Birds-eye view showing Skovbakkeskolen in bright white. 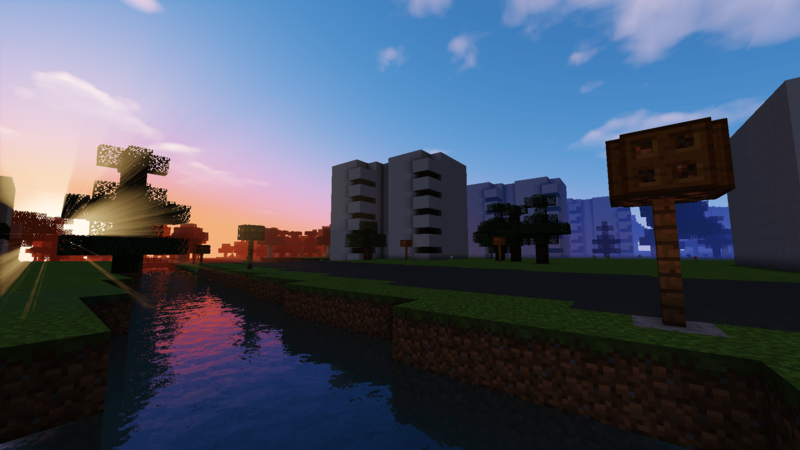 This project illustrates the abovementioned points on the strengths of Minecraft as a tool in both education and urban planning. It is a great and playful way of involving users, in this case students – who with a high probability will already be familiar with and enthusiastic about Minecraft. Some might be doubtful about the validity of this statement, when it comes to older students or even grown up citizens in general. We believe that Minecraft even in contexts beyond classroom projects can prove a very useful and convincing tool. In collaboration with the international engineering company COWI, GeoBoxers have produced a Minecraft model of the old Christian IV’s Brewhouse in Copenhagen. The building was made available for drone flying and handheld laser scanning by the Agency for Palaces and Cultural Properties. COWI’s rotorcopter drones were used for data collection, COWI did the initial data processing and produced a point cloud of the exterior of the building by photogrammetric methods. The point density was not homogeneous which is what can be expected due to obscured angles (a point can only be measured photogrammetrically when visible in at least two images). Still the density was very impressive. 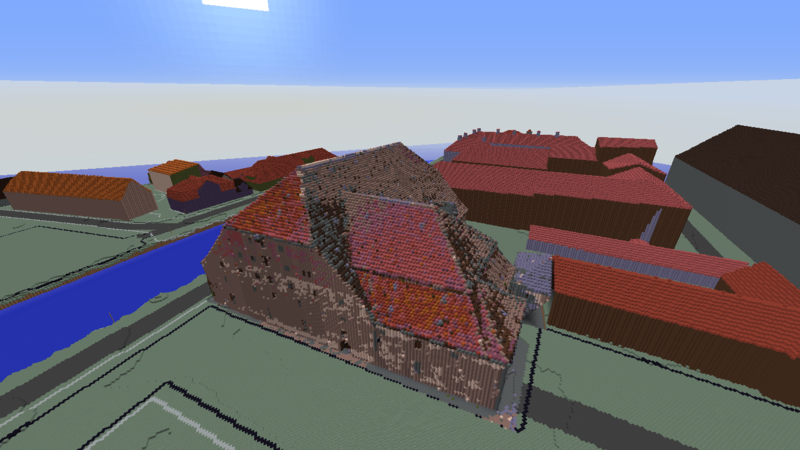 GeoBoxers then translated the point cloud of the building into Minecraft voxels and placed it into its real urban surroundings, in a larger Minecraft model generated from the freely available 3D city model of Copenhagen and the open geodata of the Danish Geodata Agency. Since the brewhouse was “scanned” with a camera, each voxel also carries a color (r,g,b) value which was transformed into one of 16 colored minecraft blocks. King Christian IV Brew House in all of its 4 bit glory. This very simple approach, which effectively uses only 4 bits of colors, yielded a satisfactory and very recognizable result. It would be straightforward to extend the method using a wider palette of textures. As mentioned earlier, Minecraft allows for customisation of the block textures. A great thing about the approach used in this project, representing a point cloud in Minecraft, is that it is quite simple and completely automatic. Generating a “proper” 3D model from a somewhat noisy point cloud can be a daunting task, which is hard to get right, without some “hands-on”. 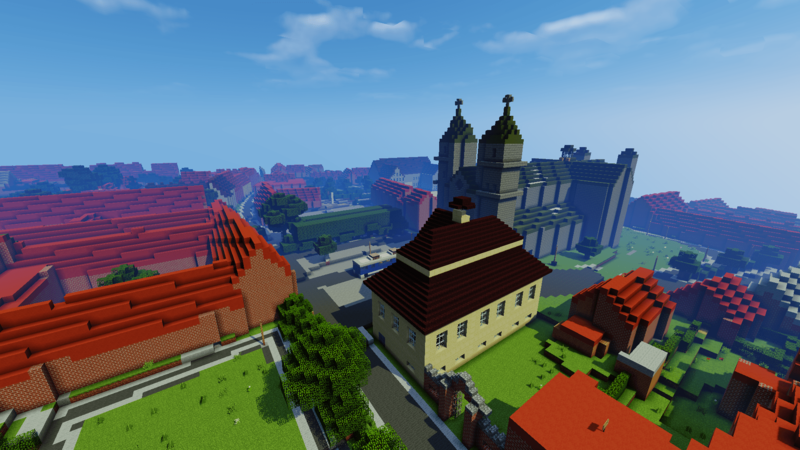 The City of Viborg wanted to have a virtual representation of itself in Minecraft to be used for education, tourism and planning. Since the world’s largest limestone mine is located in Viborg it was very important to have the mines (surveyed by lidar) modelled as well and also have the geology represented correctly. Buildings were converted from a 3D CAD format and given material attributes from the public building and housing registry. Since the model is online and accessible by the public, GeoBoxers developed tools to control levels of user interaction using standard GIS software to define boundaries where users could be given “building permits”. Also a system to track changes and get data back into GIS was commissioned. Image from Vibcraft. 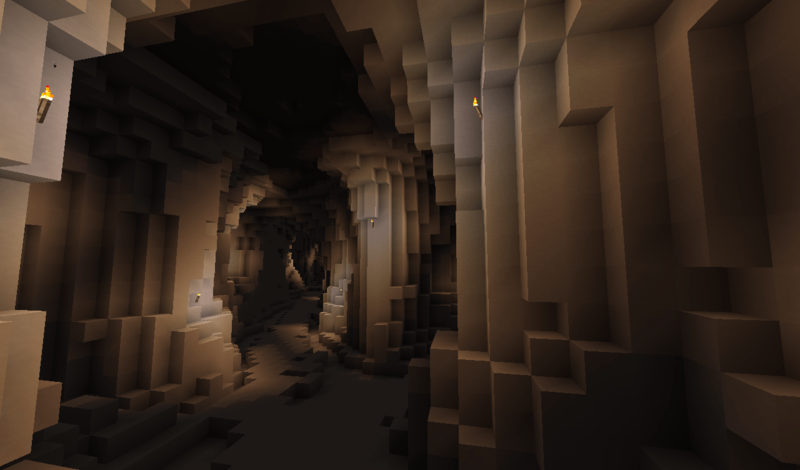 Since Minecraft data is in true 3D it is also possible to model the underground. Here we see a section of Mønsted limestone mine. The geologicial layers were imported and represented with different colors. While applications of Minecraft in education has already been widely adopted, the use of Minecraft as a tool to engage youth (and adults) in urban design is steadily emerging. We have touched upon a few use cases to illustrate how real-world geospatial data is put to use in different planning scenarios via Minecraft and we look forward to see what the next generation of both computer games and geospatial data will bring to this field. One thing is certain: Game based co-creation and game-based learning are here to stay! An architect’s vision of a new housing area imported into Minecraft. GeoBoxers is a Danish company founded by Simon Lyngby Kokkendorff, Thorbjørn Nielsen and Nynne Sole Dalå, all experts in their own field within the world of geodata. GeoBoxers excel in bringing real-world GIS and geospatial data into boxes and blocks in Minecraft for use in education, urban planning and fun.